Should You Use Retractable Leashes? 1. The length of retractable leashes, some of which can extend up to 26 feet, allows dogs to get far enough away from their humans that a situation can quickly turn dangerous. A dog on a retractable leash is often able to run into the middle of the street, for example, or make uninvited contact with other dogs or people. 2. In the above scenario, or one in which your pet is being approached by an aggressive dog, it is nearly impossible to get control of the situation if the need arises. It’s much easier to regain control of – or protect — a dog at the end of a six-foot standard flat leash than it is if he’s 20 or so feet away at the end of what amounts to a thin string. 3. The thin cord of a retractable leash can break – especially when a powerful dog is on the other end of it. If a strong, good-sized dog takes off at full speed, the cord can snap. Not only can that put the dog and whatever he may be chasing in danger, but also the cord can snap back and injure the human at the other end. 4. If a dog walker gets tangled up in the cord of a retractable leash, or grabs it in an attempt to reel in their dog, it can result in burns, cuts, and even amputation. In addition, many people have been pulled right off their feet by a dog that reaches the end of the leash and keeps going. This can result in bruises, “road rash,” broken bones, and worse. 5. Dogs have also received terrible injuries as a result of the sudden jerk on their neck that occurs when they run out the leash, including neck wounds, lacerated tracheas, and injuries to the spine. 7. 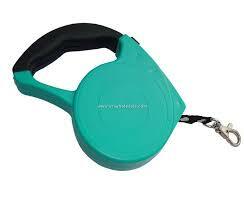 The handles of retractable leashes are bulky and can be easily pulled out of human hands, resulting in a runaway dog. 8. Along those same lines, many dogs – especially fearful ones – are terrorized by the sound of a dropped retractable leash handle and may take off running, which is dangerous enough. To make matters worse, the object of the poor dog’s fear is then “chasing” her, and if the leash is retracting as she runs, the handle is gaining ground on her – she can’t escape it. Even if this scenario ultimately ends without physical harm to the dog (or anyone else), it can create lingering fear in the dog not only of leashes, but also of being walked. 9. Retractable leashes, like most retractable devices, have a tendency to malfunction over time, either refusing to extend, refusing to retract, or unspooling at will. 10. Retractable leashes are an especially bad idea for dogs that haven’t been trained to walk politely on a regular leash. By their very nature, retractables train dogs to pull while on leash, because they learn that pulling extends the lead. 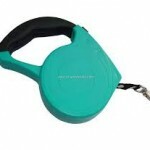 Note from PawPassion.org: There are a couple of more reasons why we have reservations about retractable leashes. On warm days, one’s hands can get clammy from perspiration and it is easy for the handle to slip out of a person’s hand. Also, some people let their dogs round a corner and they can’t see people, other dogs, or skateboarder/cyclists coming down the sidewalk.